And wanted to share a litte of the design process. But instead of the "dropped waist" and ninety degree contrast between direction of the work, this new design needed to be in one piece. 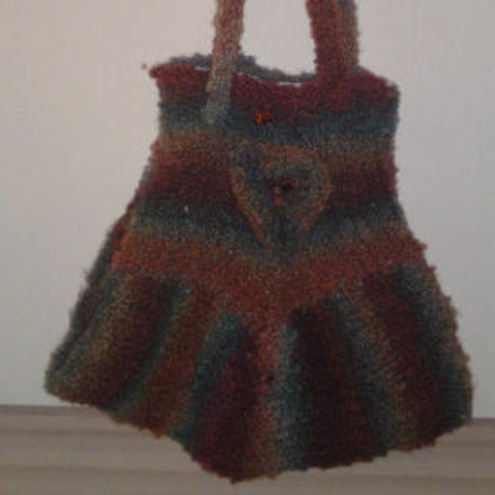 But then I realised that I was going to struggle a bit with this because to knit the whole bag in one piece would mean that the direction of the cables on the 2 top sections would not match. I'd heard of provisional casting on but never tried it so did a bit of research on the "why's what's and wherefores" and found a superb tutorial at The Knit and Tonic and decided to take the plunge. This effectively allowed me to knit the bag base in one piece, knit one top and handle, cast off and then start again from the cast on edge from the other side. It did take a bit of practice and was a bit nerve racking to start unpicking but it worked well. To work out the sizing I made a tension swatch in stocking stitch which gave me a rough idea of the number of stitches per inch. I then thought about the size of bag I wanted and the cable pattern I wanted. I tracked down the instructions for a 6 stitch cable that could be worked on a base of 10 sts. I wanted 3 cables across the pattern panel with a moss border, so needed to have 40 sts for that section. To make sure the "skirt" both pleated and got sinched in at the "waist", I then added 4 6 st panels in reverse stocking stitch. This gave a nice ribbed skirt. I started by knitting the skirt and playing with different length ideas as I went until it looked like something I was happy with. I then rapidly decreased the 6 stitch panels to form a pleat and set up the patterning for the cable pattern. Again once happy with the length I added the moss stitch top and created a double handle for extra strength and security. Once I was happy with the look I reversed the process and after unpicking the provisional cast on, worked a second cable panel and handle. I then used the bag itself as a net and drew a pattern for the lining, in a soft floral cotton. I decided this bag would look its best with a "close lining" - which although is more work, adds alot of strength and shape to the completed item. I always use this method for my shaped bags for this very reason. Once the bag was assembled I then started playing with embellishments and found a gorgeous brown tafetta bow, rescued from a box of chocolates, and a pretty brown vintage style button and played with the layout until I was happy. For me, I like the design process to be organic - to start with an idea and the ghost of a pattern but to work with the yarn as it evolves and changes into the finished item. I think this is why I very much prefer to work off pattern. I don't like things to be too prescriptive as often once a piece of work is underway, I find that I want to make small changes to reflect the mood the yarn evokes.